Salads can be a little dull, day after week and month; this will certainly brighten your lunch table, and it's so simple. Banting is the rage right now, and it has serious dangers if you aren't having a green salad every day, and several eggs a week; water soluble vitamins B6, 9 and 12, and choline must be eaten regularly to prevent a toxic homocysteine build up. To build a beautiful herb garden takes a lot of planning and work but, for me, most of them grow like weeds and we just plant a row of parsley, and then perhaps another of cilantro. It's all a bit higgledy piggledy but it's so simple and easy; fruitful too. The garden represents your personality, and how much time you have on your hands. Ours is all very rough and ready. Pepperdews and jalapenos are dotted about, potatoes and corn in another; always some legumes. Pole beans and limas grow like weeds in the summer, and green peas in the autumn and winter. It's not very pretty, but it keeps us in abundant, healthy organic fruit and veggies. What is basil you may be asking. Somewhere there must every summer be a spot for sweet basil; really it grows like a weed. 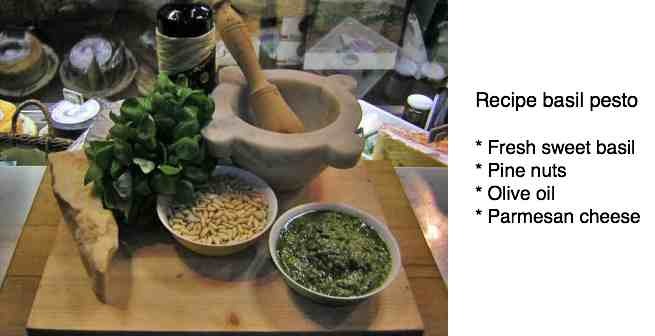 So, what goes into your pesto? It's simple; a handful of sweet basil, a tablespoon of pine nuts, a good slosh of olive oil and parmesan cheese. What could be easier? What is pesto? A simple dish made of Sweet Basil, Pine Nuts, Extra virgin olive oil and Parmesan Cheese; so easy to make in your own home. Add a clove of garlic if you like. Sweet basil will grow like a weed in any summer garden, the scent of the flowers simply heavenly; only the pine nuts are relatively expensive. Our recipe basil pesto should be standard fare in every home periodically. A traditional salad might consist of lettuce and tomato and few sticks of celery; I like to add a couple radishes and some sprouts are always welcome. In our mid climate, I prefer straight from the garden, but when I lived in Chicago we sprouted right through the winter. Now, just rustle up some hummus or recipe basil pesto and you have the perfect lunch. Chop up a handful of sweet basil leaves. Add to it a clove of gardlic, and even a slither of chili if you like it spicy. Add a tablespoon of pine nuts and keep chopping with a heavy knife until it's nice and fine. Try them both raw or lightly roasted on a hot pan. Now grate a few tablespoons of parmesan cheese into the mixture and add some salt to taste; keep chopping. Squeeze into a small cake in the palm of your hand and put into a pretty bowl. Add a couple tablespoons of olive oil, stirring it in. So that's how it's all done. Deck your lunch table with some freshly baked low GI bread, a block of butter and half a pound of cheese. A bowl of Mexican avocado soup is so easy, if you have a couple of the fruit that need to be eaten today. It's all about getting those aromatic oils and phytosterols into our diet; these are the kinds of foods that kept our grandparents looking wonderful, with all their marbles; it's part of the reason why they weren't swallowing bucket loads of pills like our generation has to. Butter is back by the way; it should never have been dispatched in the first place. A very strong research meta analysis shows there is not a shred of scientific evidence that changing to margarine has any proven benefit. Sweet basil is prone to mildew; if you live in a misty climate like ours, one must have successive sowings. Providing variety and deeply aromatic flavours is what makes Mediterranean cooking so interesting. A salad, day after day, can get a bit dull, but by use of pesto, or our authentic hummus recipe or olive pate, it's possible to make an exciting meal out of a dull salad in a very short time. By adding pesto to your meal, you've just added two of the mandatory five colours that we should consume daily, if we want to reduce the chances of getting cancer; olive pate too. Actually new research shows that those who eat 8 coloured foods per day, over twenty years have a 35 percent lower rate of all cause death; that's massive. One other joy of these condiments is that, being rich in vegetable protein and olive oil fat, they lower the glycemic index of any suspect carbohydrate; for example on bread, or on the side with a baked potato. They fit in perfectly with the banting diet. Only extra virgin olive oil contains oleocanthal that acts as an anti inflammatory agent reducing the pain and inflammation in the body; it's best in your recipe basil pesto. Use ordinary olive oil only for cooking. Read more about oleocanthal at the olive pate link above. Costly? Yes, spend the extra on extra virgin olive oil or spend umpteen times as much having the aches and pains in your body sorted; that's why this is on a chiropractic site. Eugenol is the sweet smelling oil that makes your recipe basil pesto smell simply divine; I could easily get hooked on this strongly anti inflammatory compound. Walking through the garden when it's in flower you'll notice there is great interest by the bees in the sweetly scented nectar too. It's found in another favourite too; cloves. Oleocanthal is the natural anti inflammatory found in extra virgin olive oil; it gives it the burning taste at the back of your throat than means you have the real McCoy. Like refined flour has had the benefits of the germ and bran removed, so only the extra virgin olive oil has the oleocanthal. We have an obsession that food must slide down the palate and give only the most perfect and sublime taste on the tongue; at great cost to our health. As much a possible, use only healthy flour and extra virgin olive oil for the rich source of B vitamins, oleic acid and natural anti inflammatory oleocanthal. Or, be greeted with a pill box for breakfast every day, and regular visits to the doctor and chiropractor. 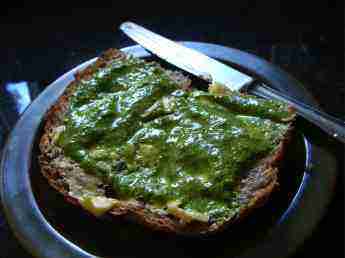 This is the most delicious 100% wholewheat bread, a thin layer of butter and a thick smear of recipe basil pesto; just what the doctor ordered. Butter is back, by the way, and should never have been sent to Coventry, so the researchers have now concluded. This is a very large site; if you're looking for the meaning of "banting" for example, just type it into the site search function. Every family has its favourite; well, having said that, some of us eat salads very reluctantly, and only if it's smothered with mayo. Mayonnaise it's okay if it's homemade with olive oil, but the supermarket stuff is make with polyunsaturated oil, and loaded with chemicals; a recipe for inflammation in the body and cancer. I'd rather have a helping of recipe basil pesto. Research shows that folk who enjoy eight coloured foods per day, on average, have a 35% lower all cause of death; and that research followed a large group of people over a twenty year period. One day add your recipe basil pesto, another a dollop of hummus; homemade mayonnaise is fine too, but we warned. All these healthy side dressings, devoid of chemicals don't keep. Yes, it takes energy to eat healthily. 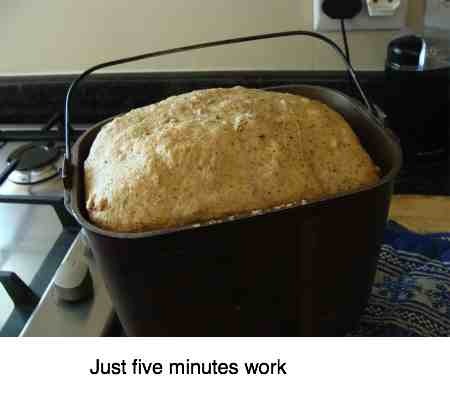 Once you're in the groove, it takes only five minutes to whip them, and then they keep for about three days. After three days our excess recipe basil pesto goes into a hot pot, or along with the hummus into our olive bread recipe; there it acts to lower the glycemic index. In ongoing attempts to make ourselves less reliant on red meat for protein, we are always on the lookout for healthy, slow foods, made fast that are simple to prepare. This easy pesto recipe uses frozen peas and can be rustled together in minutes. Understanding the term glycemic index is the only way to lose weight successfully, and relatively painlessly compared to all the other fads, by the way. Even the best chiropractic cannot cope with your joints and muscles if they are angry and inflamed. Using extra virgin olive oil on your food, and for example to make your recipe basil pesto, is one way to support the work your doctor is doing.